At Southwark, the train entered the platform at a usual speed but didn't brake on time and slightly overran the platform. On the double doors, the left carriage door matched the right PED. The driver immediately said "dear customers, please be aware that wasn't me, that was the computer. I ask of your patience whilst I contact my line controller". After about 2 minutes, the train departed without opening its doors leaving a few people visibly confused and a few angry faces on the platform (there had been quite a gap in the service). The driver apologised and directed people to change for an eastbound service at Waterloo (what you'd expect) but the whole situation was rather strange. No system is perfect. It may be that the braking system on that particular train, coupled with the natural wear and tear of the track and wheels, led to slightly different behaviour than expected by the computer. I wouldn't be so concerned, unfortunate as it may be that it happened. Usually it's just the computer calculations (VOBC) falling to account for the wear of the train it self, the track standards and adhesions on the JLE are probably some of the most consistent on the network but the trains themselves are subject to much less predictable forces over their service and as such minor discrepancies can build up starting with something as minor as a couple of faded/sluggish brake pads that ultimately skew the calculations of stopping distances meaning situations such as the one you described can occur no real fault of anyone. The fact that Jubilee line trains never identically line up with PED's every time shows just how many possible factors computers still can't account for reliably and still require the human skill set. Arriving at Waterloo yesterday from Westminster the train stopped and the moved forward a couple of yards so guess the opposite to the above but at least I didn't have to travel via Southwark! Same thing happened on the district coming into St James Park, In the morning. Once that train had overshot – the acceptable “opening doors” zone, then I suspect the driver had no option but to proceed to the next station without opening the doors. 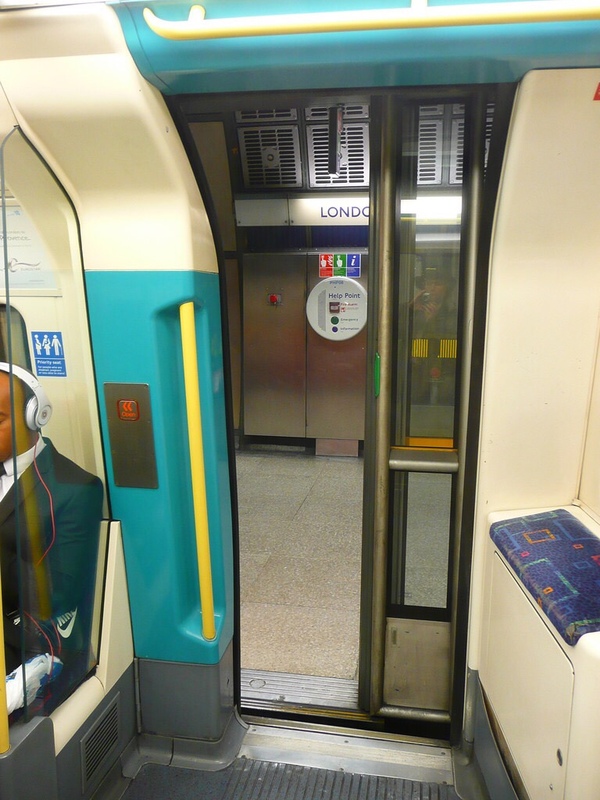 On stations with PEDs I suspect the size of the “acceptable zone” is probably far more restricted than that required to release the doors on S7/S8 stock, and even they encounter a similar problem of passing the mark once in a while. Undoubtedly variables like passenger loadings, rail conditions and brake efficiency can all contribute to the computer having a hard time stopping precisely at the same spot every time. Train headways and allowed platform dwell times are also factors which make the challenge harder and I guess someone in TFL towers has to decide the balance between the occasional overshoot and running a very intense service. Obviously if the service was less intense then the approach speed profile could be reduced sufficiently to pretty much guarantee you stop on the mark but with the obvious impact on line capacity. If overshoots occur frequently at that platform then hopefully someone will tweak the approach profile. The original Victoria Line ATO had quite a big margin for error in terms of stopping. On the Jubilee and other ATO lines, the only way the driver can attempt to correct an overrun is by moving the manual driving handle. However, this leads to a full EP brake application and disengages the ATO, requiring the driver to reset it in some way. Of course, the other option is to press the emergency stop button on the driver’s console. Once that train had overshot – the acceptable “opening doors” zone, then I suspect the driver had no option but to proceed to the next station without opening the doors. There are options, but they are not normally considered worth the hassle. You can, however, drive it back to the correct position. However I suspect that much like the Victoria line ATO system, the Jubilee presumably still allows the driver to intervene and apply extra braking if he spots the train is coming in a bit too hot. You could put the emergency brake on and bring the train to a stop, but you can't just drop in and put on a bit more brakes. The traction brake controller must be stowed at all times when the train is in ATO, there's no brake handle you can use like they had on the 67s. And with an impact on journey times. The brake rate in the open is already very low, but that's more about wheel slide in adverse conditions. Thanks for all the info, but I have another question. There was already a 6 minute gap in the service during rush hour so when we entered the platform the 'signal' surely would've been green. Why was so much time wasted (about 2 minutes) before the train continued. I understand there must be some sort of procedure but stations West of Southwark must've been getting dangerously overcrowded. It was clear the doors couldn't open so couldn't he have contacted the line controller on the move or is that not allowed? The Jubilee line doesn't operate with Red/Green signals in the traditional sense and as such there are no track based signals in use with ATO on the Jubilee line extension and most of the other parts of the Jubilee with a few exceptions. Since the line uses Automatic Train Operation (ATO) or Transmission Based Train Control (TBTC), the driver will only get authority to move in ATO when a three note tone sounds with the message, "ATO Start Required" and a roughly 10 second countdown for the driver to close the doors, get his pilot light (Door Closed Visual) and activate ATO for the train to start . I'd assume that an overrun of this nature would have to be reported immediately to the line controller in situe because the train won't be able to start up because it hasn't received it's ATO target command as part of the usual sequence of events when a train stops correctly. Oh Ok, makes sense. I wasn't sure of the correct term to use which is why I put signal in quotations. This is really interesting actually. Am I pushing it or may i ask what happens next? Would the driver restart the whole ATO system (I'm sure that's probably the wrong terminology) or will it be done via the control centre. I'm not to sure on this as the answer I gave you was an assumption based on the usual procedure when working ATO on the Jubilee, given that the train as you said was stationary for a while, the controllers would definitely need to manually input some form of command or relay instructions to the Train Operator to give authority to move off either by re-entering the train onto the control system or by giving the start command again. I think that’s what happens on the Central. The train has to be driven in coded manual until the next station, where ATO can be resumed. On the Central in the event of an overrun I believe you will indeed have to go in Coded Manual you're right. I think it has to do with the potential that the ATO data has become corrupted. This does in theory require permission from the line controller. On the Jubilee you could similarly select Protected Manual and drive to the next station or wherever, assuming you had a target point. There wouldn't be any particular necessity to get as far as the next station, unlike on the Central where you need to stop over the PAC loops to get your ATO data, however that's obviously the most logical point. It's very important not to get this confused with the RM procedure, however, which would not be used. Some general comments in relation to this in addition to the other useful ones already posted. I agree 2 minutes is a long time from a service perpective, but in that time the driver had to make the announcement, call the controller and wait for a reply, then the contoller (or signaller more likely) would have had to reset the computer to allow the train to continue. To get a target point under normal conditions the doors would have to be proved cycled (opened and closed) first, presumably so drivers don't forget to do so. In this case with no door cycling it would have required controller / signaller input to reset the system to allow the train to continue. Possibly in this case the VOBC would also have been swapped over by the control centre to prevent the same thing happening at the next station, i.e. normally the rear VOBC is "Active" controlling the train but the front one could have then been made the active one. (If it was me I would have driven in protected manual - PM - to the next station anyway to make sure the same thing DIDN'T occur!) Fortunately in this instance it was Southwark rather than Waterloo, which would entail more inconvenience as the overcarried passengers would have had to change at Westminster where there is no simple cross platform changeover as the east and westbound platforms are on different levels. Regarding the possibility of the driver applying an emergency brake, the train is normally coming in at or close to the target speed and there is no knowing it may overrun until the very last split second, by which time taking into account reaction time it would make little or no difference. I have heard of instances of trains sliding through due to grease on the track after night time maintenance, but I have to say the Jubilee is generally pretty reliable in stopping at the right place. @it's experience would most likely a train being driven in PM, probably a trainee driver.